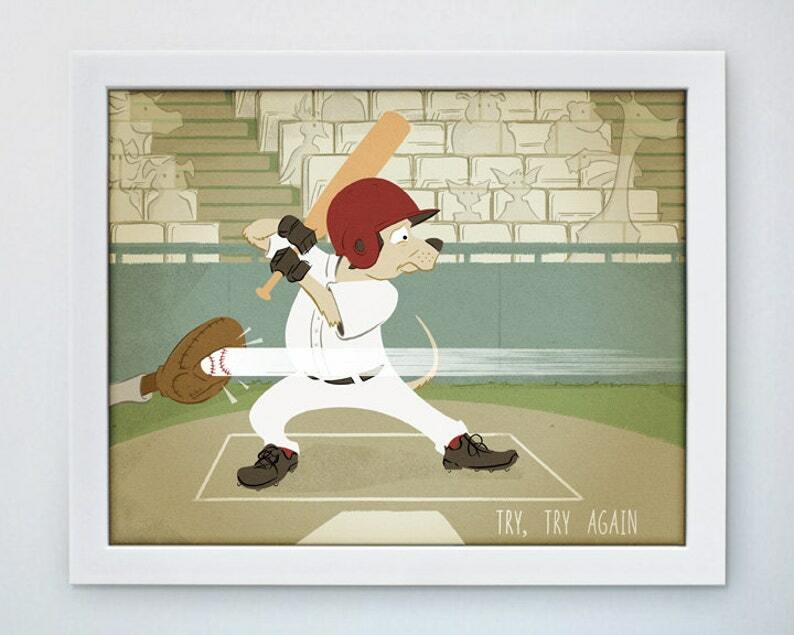 Baseball Dog - first piece in our new Try, Try Again art series. We would like to remind kids (and adults!) that you don’t always hit it out of the park the first time up to the plate. This art series is designed to ponder on defeat, but then more importantly, celebrate that flash of resolution that you WILL “try, try again”! We created this art to engage our children in discussions about new things, practicing skills, and perseverance! We provide the art - you and your little ones provide the story and the lesson! •	Available in 5 x 7, 8 x 10 and 11 x 14 - each with full-bleed print (no border, the image will fill the entire frame opening). The 5 x 7 version is slightly cropped as shown in the third photo.